Yet another post of beers made here in Brooklyn, though a purist would point out that these cans were not. Kelso, the smallest of the three Brooklyn breweries (and necessarily the subject of my next post), is the only one making all their beer within the borough limits. The selections I’m trying tonight were made by Sixpoint, the bigger of those “other” two Brooklyn breweries, but brewed in a facility in Pennsylvania. I’m not opposed to contract brewing, but as adamant as Sixpoint is on the superiority of Brooklyn it sure seems out of character to brew out of state. Anyway, on to the beers. 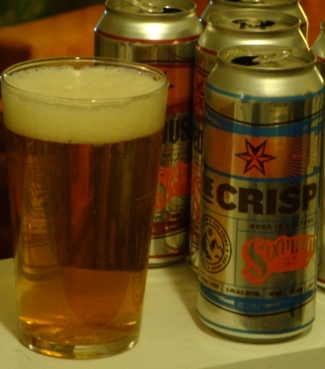 The Crisp is Sixpoint’s lager, a brilliantly clear straw colored beer. The off-white head is ample, largely because it is supported by a serious effervescence. The hop nose is significant. A loud wet-hop character is joined by the herbal aroma of noble hops. Though not entirely unpleasant, it leaves no room for the malt to come through, a major detriment to any lager. For a beer whose name is “The Crisp” the flavor is anything but. A lingering sweetness makes the body too full, even from the first sip. But that’s the only real influence of the malt. The promise of the nose is wantonly fulfilled — the strong herbal and wet-hop flavors are almost overpowering. There is virtually no hop bitterness to balance, nor malt flavor to justify, the thick body, though warming it becomes somehow a bit more balanced. 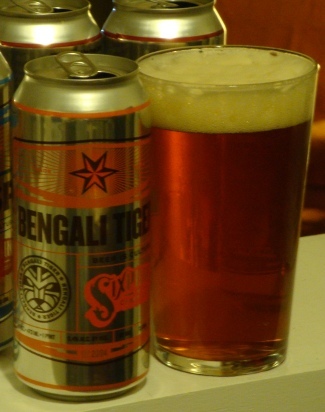 Next up, Bengali Tiger. Though Sixpoint makes no effort to pigeonhole their beers into standard styles, by the name and numbers this is clearly an India pale ale (with a Blake reference on the side). The Bengali Tiger is a beautiful persimmon color and barely translucent. The off-white head is so creamy it’s left a lacing on my glass before I’ve even taken a sip. The nose is richly hoppy, but never sharp. It forms a gentle tapestry of a multitude of hop flavors from several varieties as well as significant malt character. The hops are mostly that Pacific northwest citric, with mango and orange and lime. But a significant earthy and pine character is present, too. The malt adds biscuit and caramel to the picture, and there may also be a yeast fruitiness. The taste follows rightly from the nose. Rich malt flavor and a hearty hop character appear at first, blending in to the serious bitterness. But the full body and malt keep it from ever seeming sharp. Herbal and floral hops as well as pine back up the bitterness, supported by the faintest citrus flavor. Caramel and toast malt and earthy hop flavors linger, so the lasting bitterness and sweetness are not without company. It is hard to imagine a greater polarity among beers made by the same brewer. This entry was posted on Wednesday, June 29th, 2011 at 20:57	and is filed under American Ale, American Lager, Strong Beer. You can follow any responses to this entry through the RSS 2.0 feed. You can leave a response, or trackback from your own site.